Dianna Colasurdo and Brett Schweitzer are two young professionals grinding away in the nation’s Capital. They’re on the clock Monday through Friday, attend the usual work event and make time for friends when they’re not tied to emails. But what they do in addition to all of that is, what they find, the most rewarding. The digital director and commercial real estate broker are just two members on the board for Friends of Lombardi – a DC-based organization dedicated to combating cancer. Who are the Friends of Lombardi and what impact does your organization have on Washington, DC? Dianna and Brett – The Friends of Lombardi is a group of young professionals throughout the DC Metro Area who work together to raise funds that directly support lifesaving cancer research and vital patient care at the Georgetown Lombardi Comprehensive Cancer Center. With such an amazing facility and resource in our backyard, we work tirelessly to engage and motivate young professionals in the community to spread awareness and the desire to join something larger than themselves, that being the fight against cancer. You work to raise funds for the Georgetown Lombardi Comprehensive Cancer Research Center – what tie does the group have to your namesake, Vince Lombardi, and how was his life impacted by cancer? Dianna and Brett – Many people do not realize that Vince Lombardi was the head coach of the Washington Redskins during the 1969 NFL season. The following year, Coach Lombardi was diagnosed with Colon Cancer at Georgetown University Hospital, where he passed a few months later. The commitment to working towards saving Coach Lombardi’s life made a big impact of those around him. This effort ultimately led to the creation of the Lombardi Comprehensive Cancer Center, which received National Cancer Institute (NCI) designation a few years later. 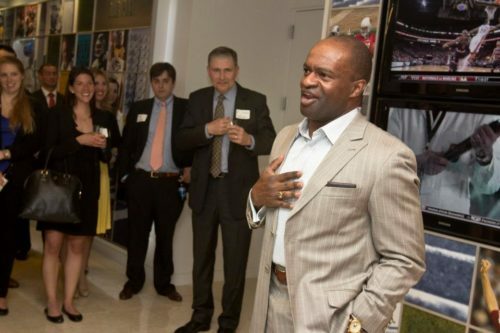 Today, the Friends of Lombardi maintains a strong tie to the NFL Players Association, run by Executive Director DeMaurice Smith, who we team up with to spread awareness and further support the cutting edge research conducted at the cancer center. With all of the important causes out there, what made you want to focus on raising funding for cancer research? Dianna – For me, this was a personal reason. I joined Friends of Lombardi after my grandmother was diagnosed with cancer two years ago. I am acutely aware that cancer touches everyone, and for it to hit so close to home made me want to take action so that, one day, we find a cure and no other family needs to hear the devastating news that their loved one has cancer. Brett – My family, from my parents to my grandparents, have been committed to fighting that nasty disease for decades. My grandfather is continuing his fight with prostate cancer, and my sister-in-law, who was diagnosed with breast cancer while six months pregnant this past June, is getting ready to start treatment later this month. Her newborn, and my nephew, Zack, who was born in August is happy and healthy and rooting her on! Knowing firsthand the harsh reality that comes along with this disease, dedicating my time and effort is the least I can do to make an impact. There are so many charitable organizations throughout DC. What is unique about Friends of Lombardi? Brett and Dianna – FOL is unique in that our agenda, for a lack of a better term, is unscripted. All board members are young professionals throughout the DMV with a strong entrepreneurial spirit and a motivation to push the envelope. This in turn creates a platform that empowers those within, and ultimately sustains the longevity of what we have set out to accomplish. 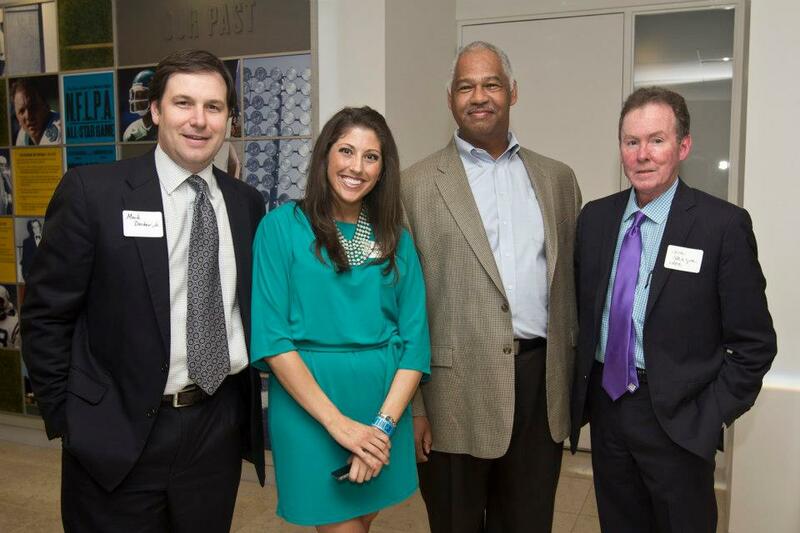 Who would most enjoy events hosted by Friends of Lombardi? Brett and Dianna – Our events work well for varying groups of people, and that is because people attend for a multitude of reasons. We see a contingent of folks attend because they have been touched by cancer and want to make a difference moving forward. Others attend as they have a great interest in sports and want to fuse their passion to do something good in their community. There are also others who just like to have a great time and our events offer them the opportunity to network with other young professionals in the area. 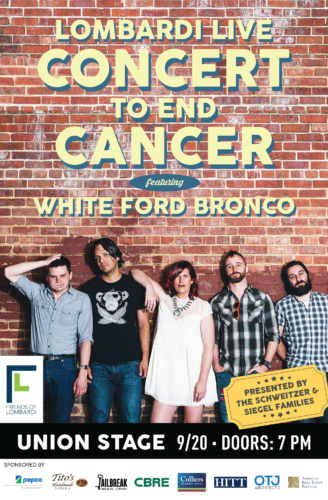 Our events range from black-tie galas to concerts (our Concert to End Cancer is this Thursday!) down to a corn hole tournament, and we see ages range from 21 through folks in their 80’s. All are welcome! Bonus! If you could draft one Redskins player to be a member of your group, who would it be and why? Brett – Ryan Kerrigan. A leader of the defense and key player on the field, his impact is felt just has much off of it. Ryan has devoted so much of his life outside the game of football to supporting children in need throughout the DC area by way of the Ryan Kerrigan Blitz for the Better Foundation. It is special to see someone who is looked up to and with so much influence, committing so much of their time and energy to create positive change in the community. Dianna – I am a big fan of Alex Smith. I candidly do not know a ton about his on-field abilities (go Giants!) 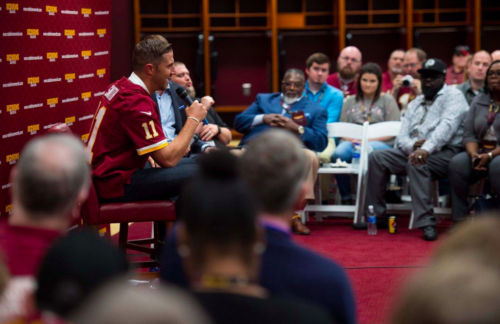 but I do know quite a bit about The Alex Smith Foundation, and admire that he’s taken such an initiative to help foster youths in their transition to adulthood. Given his background in charity work, and the care and compassion he has shown to the communities that he is a part of, I’d love to have Alex Smith as a member of Friends of Lombardi!